PhD will open doors for woman committed to helping refugees. 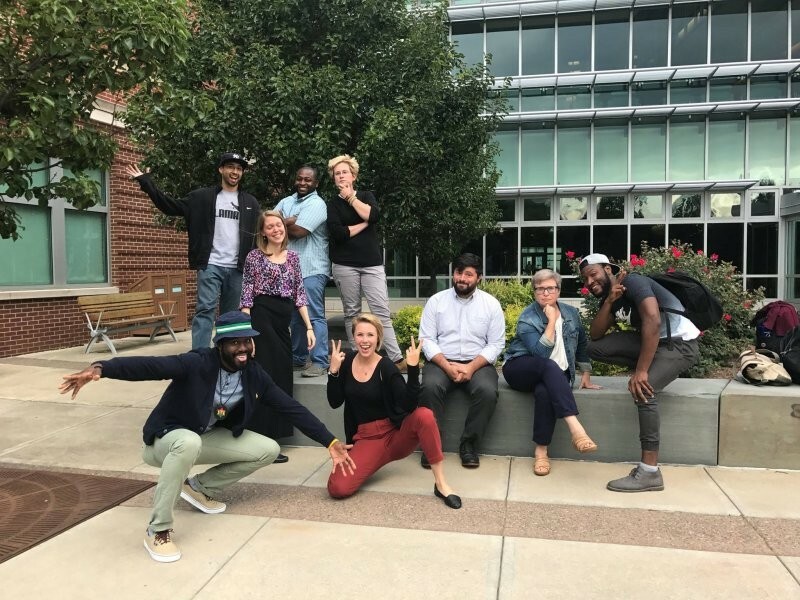 Justine Lewis, (standing, far right), with classmates in Community Research and Action PhD cohort. Image Credit: Elizabeth Mellin. Justine Lewis, (standing, far right), with classmates in Community Research and Action PhD cohort. Photography: Elizabeth Mellin. Justine Lewis has a passion for helping refugees, a quality she traces to her youth, when some of her best friends belonged to resettled refugee families. Lewis, a student in the Community Research and Action PhD program, spoke with us about her experience with refugees, her career goals and the academic program helping her achieve them. 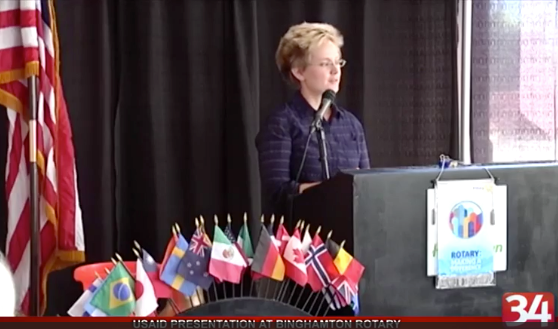 Lewis at a USAID presentation for the Binghamton Rotary, August 2017. Image Credit: Channel 34. Q: Why seek a Community Research and Action PhD? JL: After a few years in Washington, D.C., working with refugees through the U.S. Agency for International Development (USAID), I began to revisit my dream of pursuing a PhD. I’d been noticing that to get to where I wanted to be at the policy table, I needed to make that happen. I looked at Binghamton University programs and found one that could get me closer to a career in refugee policy and also bring me back to the local community. I’m close to both of my grandmothers, who live locally, and I know our years together are finite and precious. JL: Out of high school, I enrolled in Tompkins Cortland Community College. An advisor encouraged me to travel abroad — invaluable advice for a first-generation college student from a small town. I studied abroad whenever possible as a sociology undergrad at Ithaca College, and then as a student pursuing master’s degrees in public administration and human development at Cornell University. At Cornell, I was selected into the Presidential Management Fellowship program, which came with a job at USAID. How did you select a research focus? JL: At USAID, I worked with international refugees through the Department of State’s Population, Refugee and Migration office. One day, sitting in a Bhutanese refugee camp in Nepal, a small girl asked me if I was there working to find her a home. I said I would try. When I got into the PhD program, I knew my focus would be to create change for refugees by helping to shape policy that could help not only one small girl, but all refugees. JL: I’m interested in resettled Bhutanese refugees living in the United States and ways to help improve their mental health. These refugees suffer an unusually high rate of suicide. Social connections are important in the Bhutanese culture, and disconnections (culturally, socially) may be a factor in suicide ideation and other mental health concerns. I want to look at this through a new theoretical lens, one that can point to important recommendations about creating policies and other interventions to help. I’m looking at using the PhotoVoice method, in which refugees use photography to help gather research and conduct outreach. Through this process, refugees can make new connections and perhaps identify ways to rebuild a sense of community and belonging. Q: How does the program bridge your professional experience and future career goals? JL: The PhD program has helped me think in a completely different, broader way. All students in the class are studying their own uniquely individual thing. This allows us to learn from each other, expanding our perspectives overall. I’ve also learned that research should play an intrinsic role in approaching issues facing communities, which, again, is an expansion of thought in comparison to my policy-focused work in the government. Q: What surprised you about the PhD program? JL: How quickly you find your people! I’ve been to a lot of schools, but I have never been in a program where I found a “family” so quickly. Everyone is welcoming and supportive — they want you to succeed. Faculty are very generous in giving their time and expertise. Q: Is there something that makes you especially proud? JL: One of my grandmothers often says she is proudest of me when she sees me “striving for a world perspective, a compassionate heart and a steady mind.” The only thing she wants, she says, is for me to help amplify the voices of those who haven’t been heard. My mom’s counsel has always been to “just keep doing the next right thing.” If I can keep these thoughts in mind every day and work to balance theory and practice, I know I’m doing my best to make them proud.